Wearing the proper footwear on a construction site can save your feet from all types of hazards. Proper gear is a key part of construction safety. This includes heavy duty footwear such as steel toe boots. With so much heavy machinery in play and risky work being done, it is no secret that the correct footwear is necessary, and can even potentially lessen injuries and save lives. Below the many important functions of construction safety shoes are outlined. When construction workers carry heavy materials and work in dynamic environments, this means that numerous machines, processes, and individuals are all coming into play at once, falling and flying objects are a fairly common hazard to consider seriously. Protective footwear is key to construction safety because it can stop feet from being crushed during mishaps. During construction there is a risk of stepping on sharp objects, and also that of sharp objects falling from above. At a construction worksite, a soft toed or soled shoe is not enough to protect a worker from these dangerous conditions. Machinery that is sharp by nature or has a number of moving parts can pose definite cutting hazards. These include chainsaws, drills, and various other heavy machinery used for everything from concrete cutting and grinding to laying pavement. Heavy boots which offer protection and support are required for most construction jobs. Electricity can pose numerous risks on a worksite. Workers have to worry about the risk of electrical shocks and potentially accumulating static electricity, which can lead to electric sparks under certain conditions. 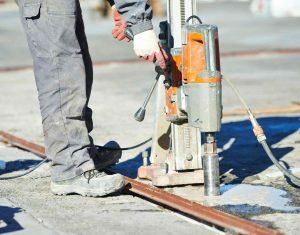 In order to reduce the risk of an accident, non-conductive footwear is paramount on worksites. These shoes are often made from leather, rubber, or other materials that do not conduct electricity and significantly lower dangerous risks for the wearer. This entry was posted on Friday, January 13th, 2017	at 9:05 am	. Both comments and pings are currently closed.